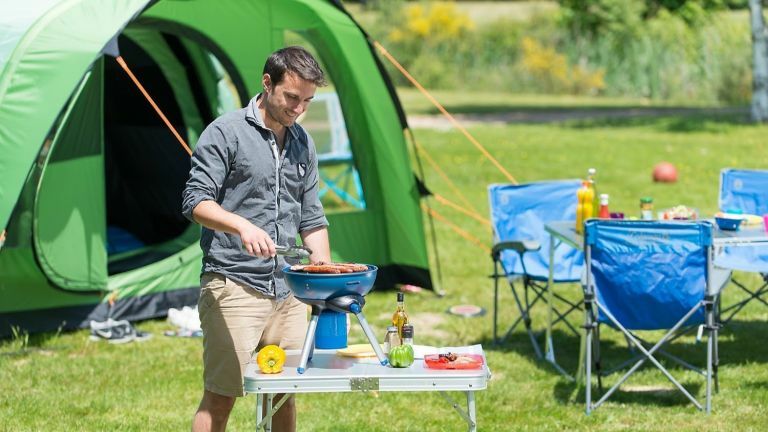 Whether you’re going hiking in the mountains or camping with the family by the lake, a camping grill is an essential piece of kit to have with you if you want to be able to... well, survive. Cooking in the great outdoors is all a part of the fun on camping trips, and they can be a great way to rustle up some home comforts like a cup of tea and a bacon sarnie in the mornings. A camping grill is slightly different to a camping stove, in that they tend to be a little more compact and easier to clean – they're effectively a portable BBQ. When considering which camping grill is right for you, think about what is most important to you. Do you want great tasting food? Or is ease of use and portability more important? If you’re looking to tick as many boxes as possible, then gas camping grills are the most popular choice. Gas canisters are easy to transport and aren’t too bulky, plus they tend to be the closest thing you’ll get to cooking at home. Charcoal-fuelled camping grills are cheap to run, but you will need to think about transporting the coal, and remember you’ll get that smoky flavour to your food – some like it and some don’t. Check out our top picks for the best camping grills, just keep an eye on the weight to make sure you’re not going to struggle with it when heading to pitch your tent! This powerful gas camping grill is essentially a portable BBQ. It has both a grill and stove cooking option and is relatively large, so it’s great for cooking for big groups. It’s said to be easy to ignite and easy to clean up afterwards, with a water compartment that collects any grease. Those who have tried it find the food to be of barbecue quality, and it has a kettle function so you can make the perfect brew even when living in the great outdoors. This portable and compact camping grill is designed for use with coal or wood, which can make cooking on it feel a little more traditional. It simply folds out and can be easily positioned with the carry handles on either side – all you need to do is add the coal or wood, light it, and away you go. Users have said it's easy to use, and recommend lining it with tin foil so that you have an easy clean up afterwards. It’s super lightweight, and users have found it holds up surprisingly well for multiple camping trips. If you are worried how you’re going to boil your water for your cuppa and make your bacon sarnie, then this combination grill will provide the versatility you need. It features two stoves and one grill which easily collapse into a handy carry case for use wherever and whenever you like. This will allow you to have plenty of space to cook different items on different areas. It has anti-slip rubber feet so even if you place it on grass you can expect this grill to remain stable when cooking. Okay, so an electric camping grill is kind of cheating, but if you’re someone who is more of a glamper than a camper, this could be the grill for you. It of course requires a power outlet, so make sure you have that facility available to you at your campsite. The variable temperature settings allow you to cook all sorts such as burgers and sausages, but wouldn’t be suitable for boiling water for your cup of tea. Traditional BBQ is made easy on this gas camping grill. Users say it provides the smoky flavour you get from cooking on a barbeque and it heats up nicely to cook a range of different meats. It does require some assembly, but is said to be easy to put together, and when in use the stand doesn’t get too hot to touch. If you’ve often used disposable BBQs in the past but want to invest in something more robust, this camping grill is a great place to start. This simple yet effective toaster grill will allow you to make quick snacks on your camping trip wherever you are able to make a fire. Simply hold the grill above an open fire and flip to cook evenly on both sides. As well as sandwiches, users have said they successfully cooked omelettes, pizza and much more. It’s also a good healthy option for those who don’t like their food laden with grease. The non-stick plates make it easy to clean and it has heat-resistant handles, so it’s safe to use.